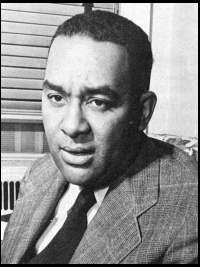 To celebrate the anniversary of his 100th birthday and Black History month, Richard Wright’s final novel is being unveiled to the public 48 years after his death in 1960. “A Father’s Law” of a black, suburban, Chicago police chief and the son he suspects of having committed several murders. Wright mines familiar territory: race and class and the psychology of crime. From what I have read, the novel will quite possibly beckon us, as readers to ponder what conditions necessitate law and how a father's guilt and probing may quicken a son's embrace of real or imagined criminality. Wright’s work had the ability to draw the reader into the story and did not allow for passivity, complacence, or indifference. It forced the reader to take stand and inspired arguments about values, conflict, class, and race. Richard Nathaniel Wright was the grandson of a slave and the son of a sharecropper born in 1908 on a plantation in Roxie, Miss., near Natchez. He came from a time and place that would shape much of his writing about what it means to be black, poor, burdened and hopeless in this country during the first half of the 20th century. Abandoned by his father, Wright worked a series of odd jobs to take care of his chronically ill mother and a younger brother. He moved to Memphis when he was 19, then to Chicago, where, dazzled by the words of H.L. Mencken, he began writing seriously and, for a time, embraced communism. Wright first gained national attention in 1938 for his collection of novellas, "Uncle Tom's Children," which fictionalized lynching in the Deep South. Two years later, he completed his first novel, "Native Son," the searing protest story of Bigger Thomas -- one of the most memorable characters in American fiction -- who accidentally kills a young white woman in 1930s Chicago. Victor Love, Matt Dillon, Oprah Winfrey and Elizabeth McGovern starred in the film version of the book. The book, which explores how Thomas became an angry, tragic product of his social environment, was the first black best seller and the first work by a black to be selected by Book-of-the-Month Club. In 1945, he wrote another best seller, the autobiographical "Black Boy." The books made Wright one of the first black authors to explore the complexity of the black experience and the nation's racial divide. "Native Son" and "Black Boy" are now required reading in many high schools and colleges. Wright wrote in long, sweeping sentences and provided uncomfortable detail about the barbarism of the Jim Crow South and the unfulfilled promises of life in the North. His voice was urgent, indignant and collective. Though his words were enlightening and influential, Wright found himself disillusioned by the United States, where he was reminded of his blackness routinely. Wright moved to Paris with his wife and daughter by his 40th birthday. He was part of a wave of black creativity that included Josephine Baker, James Baldwin and Romare Bearden, all of whom went abroad to escape the racism of America. Amazingly, I'm not a big fan of Wright's work. Yes, I do know it is not the most politically correct thing to admit, (being an African American writer, myself)but it's true (smile). On the other hand, the book you described does sound awfully interesting. As long as there are no vivid description of murders, I just might be willing to give Wright another read. Thanks for the info. Hey Lori, you know what you like; however I do know how you feel because I am like that with Toni Morrison's work...I just can't go there. Wright's daughter stated that the work was quite a departure from his earlier writing, possibly due to the fact that he had been living in Paris for years by the time he wrote this book. His earlier work was a product of his experiences while growing up. My taste in books is a lot like my taste in music and films, very eclectic, so I am going to give it a try. Looks like this one's going to move to the top of my reading list. Hell, I've already read Black Boy and Native Son. He's one of my favorite writers. I was therefore quite fascinated by what Frances Saunders Stoner said of him in her book The Cultural Cold War. She contends that Wright (along with other intellectuals and artists) was courted by the CIA's international propaganda machine during the 1950s. He appeared to have kept his distance from them, however. That's got to say something about the man, his intelligence, and his integrity. At one time Wright considered himself a communist, so I doubt he would have ever help the American government. In fact Jim Crow laws and the lack of governmental intervention on behalf of Blacks was the main reason he left this country to begin with. He would have no earthly reason to assist the CIA, FBI, or any other official entity within the United States. My interest in criminal justice makes "A Father's Law" a must read for me. Let's compare notes afterwards. I haven't read any of Richard Wright's work, but maybe I'll give him a try. I wish that someone would show the original version of "Native Son", which starred Wright in the role of Bigger Thomas. Hey Malcolm (pardon me for talking over you PJ), but the original movie, A Native Son appears on TV ever so often. IMHO, it's pretty awful. Really, Wright should have stuck to writing. The last time I tried to watch the movie version was a couple of years ago, right before we moved from Cleveland. Malcolm, while a knew there was an earlier version, I did not know Wright himself starred in it. I would be interested to see the film because an author acting, now that intriguing. Hey Lori, no problem talk away. I know absolutely nothing about "Native Son" starring Richard Wright. You already knew it was a bad film so why were you willing to watch it again? Were you hoping that it somehow had gotten better?